The Boxer Energy Sustainability and Tracking program (aka BEST) has been carefully analyzing the return on investment that our recently installed Variable Frequency Drives have the potential to provide. The results of such research has truly been substantial, to say the least. Air conditioners indubitably require a lot of energy, due to the vast task of keeping occupants in a building cool. This amount of energy only increases with the size and scope of the building. For this reason, the cost of running a cooling unit will often take up a sizable chunk of a company’s utility costs. This is where a variable frequency drive (VFDs) steps in. This piece of technology, also sometimes referred to as an AC drive, adjustable speed drive or inverter, is made to be attached to the motor of an air conditioner, or other such cooling methods like a pump or flakt fan. The computer will then moderate the speed of the motor as well as the torque in order to match the load requirement, allowing the motor to perform with pique efficiency. This results in less consumption of energy, as well as a correlating drop in utility costs. While the savings can vary based on the size, type and duty cycle of the motor, on average a variable frequency drive can save a company anywhere from 3% to 13%. One helpful way to understand this process is to imagine a car on a particularly hilly stretch of road. On the way up one of these hills, the driver will press down on the accelerator in order to maintain his or her preferred speed. This requires the engine to work hard, using more gas. After reaching the top of the hill, gravity will begin to take effect on the decline. Instead of leaving their foot on the gas, the driver would presumably let off the accelerator or maybe even brake to keep from going too fast. The engine stops working so hard and saves some gas. The VFD will perform a similar task for an air conditioning unit. On a particularly hot and busy day, when the office temperature is high, the VFD will increase the speed of the motor to bring that temperature down. Then, once it begins to cool off outside and the office empties out, the VFD will decrease motor speed, since there is less heat being generated in the office. VFD installation has had proven high return on investment time and again, becoming one of the BEST program’s most important energy sustainability focuses. In order to calculate approximate annual savings, a quick cost-benefit analysis is conducted taking only a single minute. Thanks in part to cost effective VFD installations completed by a trusted vendor, the cost of labor and materials has seen significant drops when taken in context of the rate of output. 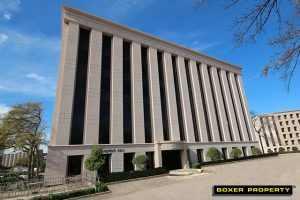 One of our Houston office buildings at 507 N Sam Houston Parkway exhibits the kind of success VFDs have displayed consistently. A 75-horsepower (hp) VFD was installed to the building’s 69-hp flakt fan. 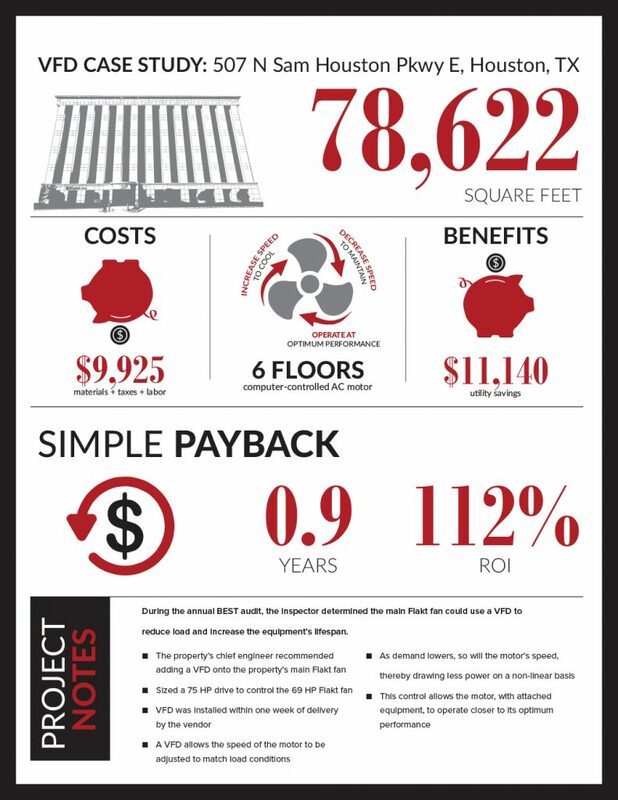 The VFD installation total came out to under $12,000, yielding the 507 N Sam Houston Parkway location a 112% ROI. Continually monitoring consumption over time and addressing any usage anomalies as they happen will help us validate our findings further. Variable frequency drives are only one of the various aspects of Boxer Property’s Boxer Energy & Sustainability Tracking (BEST) program. This program seeks to get a building running at maximum efficiency, both in terms of cost and in energy consumption. Every Boxer Property building must pass a painstaking test based on our meticulous set of standards in order to be approved as an efficient operation. BEST audits examine the physical, operational, systematic, and contractual aspects of a property, measuring each of these facets against high standards of efficiency. The BEST program also overhauls a variety of systems in order to get the property up to scratch. These overhauls include retrofitting lighting with the latest technology, adjusting the actual amount of electrical energy uses in relation to the amount paid for, tracking energy use each month, and often close examination of utility contracts. Whether it’s VFD or any number of the energy overhauls that the BEST programs provide, the end result is a lower final cost and a more efficient business. Learn more about Boxer’s Energy Sustainability & Tracking program.